Yes. That's right. I'm wearing suspenders. I stole these suspenders from my brother when I was home a week ago. He never wears them so why not put them to use? They hold up my pants quite nicely. love the coat. and the suspenders are too cute! so ridiculously cute jen! loving the 5th picture!!! have an amazing weekend! I LOVE that you are wearing suspenders! You look too freaking cool with them. Definitely do this again. 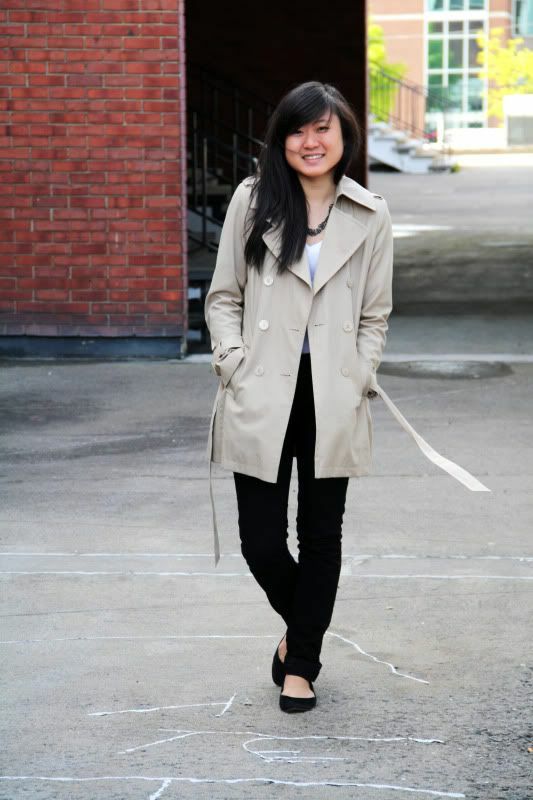 Yay I love trench coats, and yours is no exception! It looks lovely on you! The suspenders are so cool as well! You're so cute and chic! And gotta love underage drinking. Just be responsible! Love this post! LOLed when I read the title. Fabulous trench!!! Wowsa! That was a surprise!! I didn't expect to see that beneath your trench. Some fake Rolexes maybe but not those! ;) Have fun tonight! I've been thinking about getting a black or navy trench coat ... but your post has swayed me to purchase a creamy/beige one!! I love your trench too! It really is a great go with anything piece. I'm so excited for the warm weather tomorrow! Your suspenders are AMAZING. Seriously, this is such a cool look. Love your trench. looking so sophisticated in that trench! oh i love trenches, looks so perfect! i like that u combined flats to it, cute and stylish! The color is great. You keep the things simple and I like that.Good luck with your finals! Oh I wish I had a younger brother to steal clothes from. And the trench looks great on you - its such a staple you'll wear it foreverrr! That trench coat looks awesome! Very classic outfit; I like the black skinnies and flats. So classic and cute! Girl that trench is Über cool!!! I am desperately looking for one but shorter!! And they seem to be all sold out! The look is perfect! You are lucky 'cause here it is rainning... and I have to wear a trench and my hunter boots... ugh!!! i love your suspenders and the classic trench coat! omg, why are you so coool !!!! :) hehehe but seriously, love the suspenders. sorry i missed a few of your posts - i just scrolled down and, lovely outfits like usual :) i really like your shoes. Ah I have finals coming up too! Too stressful. 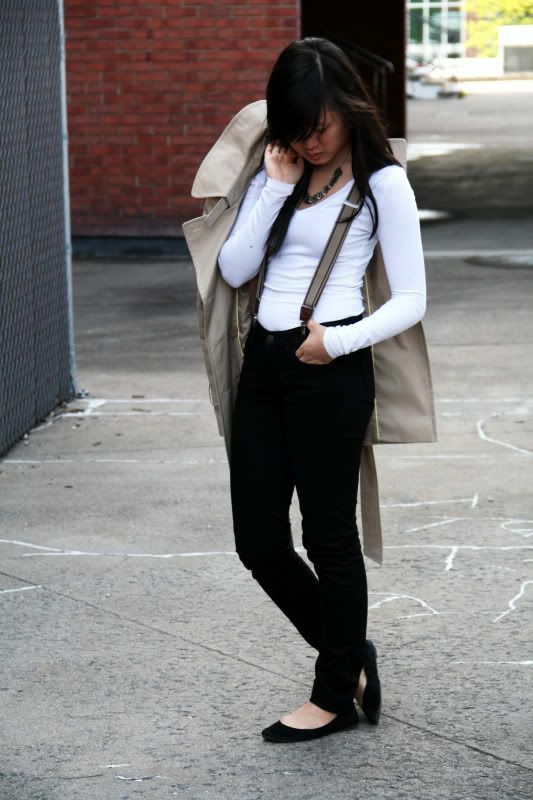 I love the classicness of the trench and suspenders and you're very pretty! um those suspenders with that trench! perfect! adorable and simple! love it. I love this outfit Jen! Suspenders are my favourite, and yours are adorable, I kind of feel like buying a new pair now, haha. By the way, do you mind if I use one of these photos, I've been planning a post on trench coats for awhile now. Love the suspenders, they add such a cute twist to your classic look! love your outfit ! especially trench coat and suspenders ! That trench coat is diviiine! Also OHMYGOD suspenders!!! gorgeous outfit, that trench is PERFECT! AH I love it! I really really love this look! The suspenders, the jacket! It's simple.. yet really funky and totally stylish! Loveee! I just came across your blog and you have SO many cute outfits! love this one, so classic - I'm a sucker for a beautiful trench! i love simplicity of your outfit, gorgeous! i am in love with such simple outfit! such a classic look..never goes out of style! i love how you rocked that trench and suspenders! hope you do get to visit the beach! i think i've had too much of it this summer...and we'll have more until summer ends..hehe. You look really really adorable, it's like a granny 50's look with an androgyn touch. Love the trench, great investement. 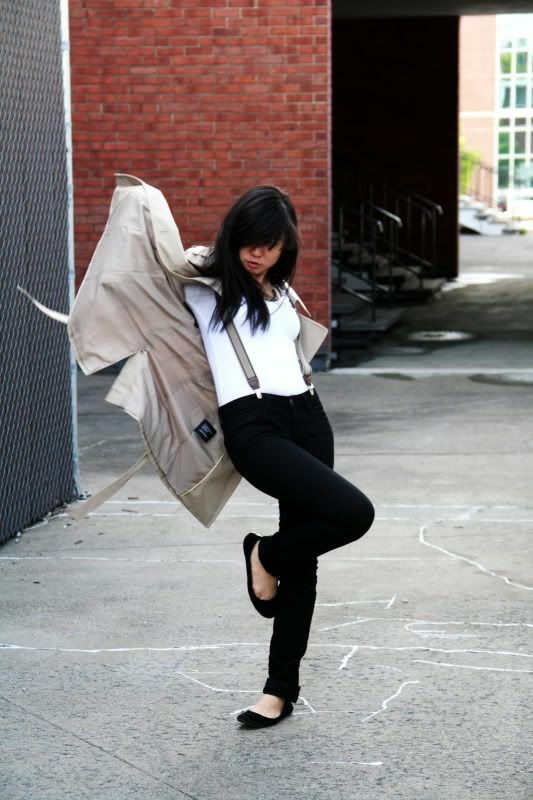 I want a trench so bad, and you pull off those suspenders like it's no problem! so cute! Really like it combined with the suspenders! awesomee blogg !! lovee it :),, loves all ur outfit especially with all those colorful tights!! This is definitely my favourite outfit of yours... ever! wow, you're rocking the suspenders and you just rocked my world with this outfit :D love the third picture A LOT <3 hope you had fun at the birthday party! I adore this! Great choice with the suspenders! Such a fun and exciting accessory! I love this blog and your style. I have started an fashion blog myself and would love it you could take a look at it.